Capture 4K video and take 12-megapixel still photos from the air with the DJI Inspire 1 Quadcopter with Integrated Camera and 3-Axis Gimbal. Forgoing the fixed landing gear design found on many earlier quadcopters, the Inspire 1 features a retractable arm system whereby the underside of each prop motor has a foot to act as a landing pod when the arms are lowered. In-flight, the arms lift up to provide the camera an unobstructed 360-degree view. A 3-axis gimbal keeps shots steady and the camera pointed the same direction as the quadcopter banks and turns. The camera records internally to microSDHC/SDXC memory cards (16GB inlcuded) and can also beam a live 720p feed to a mobile device running the DJI Lightbridge app or a monitor or FPV glasses with an HDMI input. One transmitter (radio controller) is included and a second can be added so that one operator can pilot and another can pan and tilt the camera. As with many other multi-rotor systems, the Inspire 1 relies on a GPS-based stabilization system that - thanks to spatial awareness - is able to hold a position even when experiencing wind interference, can compensate for overzealous pilot inputs to help avoid stalling, automatically brings the aircraft home in the event of signal loss or at the press of a button, and makes possible a number of semi-automated flight modes that can be enabled through the app. There is also an "indoor" mode which relies on Optical Flow technology - essentially a special camera - provide stability indoors or in other contexts where GPS is unavailable (Note: certain features will be unavailable in indoor mode). 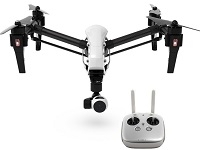 This SKU includes the Inspire 1 along with gimbal and camera, a transmitter, a flight battery, a battery charger, and a tablet holder that mounts on the transmitter. To store and transport the aircraft, a case with fitted cut-outs is included. It holds the Inspire with rotors detached, one or two transmitters, props, spare flight batteries, and more. The prop arms rest in a lowered position when the Inspire is on the ground, acting as landing gear. Once in the air, they can be retracted to give the camera unobstructed views across 360-degrees. Carbon fiber is used in the construction because of its high strength to weight ratio. The all new 13 inch quick release rotors are built with the unique DJI “Z-Blade” design. They have been enforced with new carbon fiber compound material to ensure excellent performance with increased stability.